A teleoperation system for a construction robot works effectively in a hazardous environment. However, it has problems with work precision and mental workload. In this study, a moving visual support system using a drone is developed to solve these operability problems. The usability of the system is confirmed through a subjective experiment. H. Yamada, N. Bando, K. Ootsubo, and Y. Hattori, “Teleoperated Construction Robot Using Visual Support with Drones,” J. Robot. Mechatron., Vol.30, No.3, pp. 406-415, 2018. Special Issue, “Unmanned Construction to Become Familiar,” Nikkei Construction, Vol.296, pp. 38-56 (Nikkei Business Publications Inc., Archive CD-ROM2002, No.155490), 2002. D. Zhao, Y. Xia, H. Yamada, and T. Muto, “Presentation of Realistic motion to the Operator in Operating a Tele-operated Construction Robot,” J. of Robotics and Mechatronics, Vol.14, No.2, pp. 98-104, 2002. 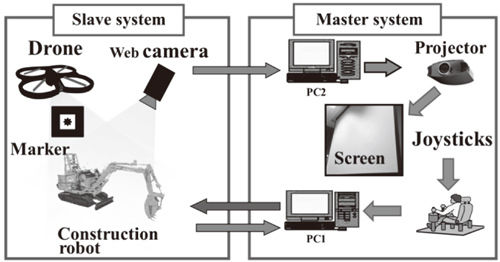 H. Yamada, M. Gong, and D. Zhao, “A Master-Slave Control for a Tele-Operation System for a Construction Robot (Application of a Velocity Control Method with a Force Feedback Model),” J. of Robotics and Mechatronics, Vol.19, No.1, pp. 60-67, 2006. A. Y. Ahmad, T. Kawamura, and H. Yamada, “Evaluation of Construction Robot Telegrasping Force Perception Using Visual, Auditory and Force Feedback Integration,” J. of Robotics and Mechatronics, Vol.24, No.6, pp. 949-957, 2012. H. Lingtao, T. Kawamura, and H. Yamada, “Construction Robot Operation System with Object’s Hardness Recognition Using Force Feedback and Virtual Reality,” J. of Robotics and Mechatronics, Vol.24, No.6, pp. 958-966, 2012. K. Ootsubo, D. Kato, T. Kawamura, and H. Yamada, “Support System for Slope Shaping Based on a Teleoperated Construction Robot,” J. of Robotics and Mechatronics, Vol.28, No.2, pp. 149-157, 2016. H. Yamada, K. Kakehi, K. Ootsubo, and T. Kawamura, “Construction Robot Using Visual Support with Drones,” Proc. of 2017 the Int. Conf. on Advances in Construction Machinery and Vehicle Engineering, China, pp. 358-362, 2017. K. Kurashiki, H. Yoshinada, K. Nagatani, M. Tanaka, A. Yamashita, Y. Yokokohji, and M. Konyo, “A Teleoperated Hydraulic Rescue Robot Integrated with Elemental Technologies,” Proc. of the 10th JFPS Int. Symposium on Fluid Power, Fukuoka, 1C12, pp. 1-4, 2017. S. Kiribayashi, K. Yakushigawa, and K. Nagatani, “Design and Development of Tether-Powered Multirotor Micro Unmanned Aerial Vehicle System for Remote-Controlled Construction Machine,” Preprints of the 11th Int. Conf. on Field and Service Robotics, #24, 2017. S. Hart and L. Staveland, “Development of NASA-TLX (Task Load Index): Results of empirical and theoretical research,” Advances in Psychology, Human mental workload, Vol.52, North Holland, pp. 139-183, 1988. Y. Gouda, “Prevention of runaway of multicopter by drone spider,” The 34th Annual Conf. of the Robotics Society of Japan, RSJ2016AC1F3-05, 2016. H. Yamada, “Human Interface of a Tele-operated Construction Machine,” J. of the Robotics Society of Japan, Vol.336, pp. 400-403, 2015.